Welcome to the Padre Pio Foundation. Padre Pio sent many people to Luisa Piccarreta and would say to the people of her home town who went to San Giovanni Rotondo: "What have you come here for? You have Luisa, go to her". She received direct revelations on the Divine Will and how to perfectly fulfill, and actually live, the petition of the Lord's Prayer: "Thy Will be done on earth as it is in Heaven." The Servant of God Luisa Piccarreta of Corato, Italy, was a contemporary of Padre Pio, and even lived in the same region of southern Italy as the Padre. Although they never met personally, they knew about each other, and Luisa wrote to him when the Vatican under Pope Pius XI issued warnings about some of her writings. He was the same pope who had prevented Padre Pio from saying Mass for two years. Padre Pio sent this reply through his spiritual child Federico Abresch: "Dear Luisa, saints serve for the good of souls, but their suffering knows no bounds". The website for this book is - Kindle or paperback. My first book about St. Padre Pio is now in an exciting new second edition. Published by it also has a new title, Padre Pio and America. Another new feature is a large photo section, including many in color. The first edition was entitled The Holy Man on the Mountain. On July 5, 2008, the Imprimatur and Nihil Obstat were conferred on Padre Pio and America by Bishop Michael A. Saltarelli of the Diocese of Wilmington, and the by the diocesan Censor Librorum Rev. Leonard B. Klein. The heart of this unique biography consists of interviews with American GI's who climbed the Gargano Mountain during W.W.II, in order to meet the stigmatized saint. Contains the complete story of the "Flying Monk" miracle. Also includes chapters on people close to Padre Pio and/or who made him known in this country, such as American heiress Mary Pyle, Fr. Joseph Pius, Joe Peluso, Joe Peterson, William Carrigan, Mario Bruschi, Charles Mandina, Vera Calandra (National Centre for Padre Pio), Marge and Joe Spada (Padre Pio Foundation), and many others. A very limited number of copies of the first edition of the book are available. This edition, titled The Holy Man on the Mountain, was published by Aventine Press. Autographed copies of this first edition, or of the new edition, may be obtained. If you wish to inquire about an autographed copy, please send me an emal. Padre Pio: "I offer my life to the Lord in order to avert a universal cataclysm". Saint Padre Pio, canonized in Rome on June 16, 2002 by Pope John Paul II. Padre Pio was the first priest in the history of the Roman Catholic Church to bear the wounds of Christ (the stigmata) on his body. He bore the stigmata for 50 years, and lived in the twentieth century in Southern Italy, passing away in 1968. Though basically a cloistered monk, he erected one of the greatest hospitals in all of Europe, which he called the House for the Relief of Suffering. He spent most of his time in the confessional, where he could read the sins of penitents in their hearts, and often reminded them of transgressions that they themselves had forgotten. His miracles are so many and so fantastic that one has to be prepared to learn about them a little at a time, otherwise it would lead to incredulity. The words of Christ, "greater signs than these you shall do because I go to the Father" were fulfilled in the life of Padre Pio. He was declared Venerable by the Church on December 18, 1997, the first step on the way to canonization. He had many detractors and suffered great persecution, in addition to the painful wounds of the stigmata, most of his priestly life. Published in Christian Order, December 2006 issue. A two part article published in the "Catholic Digest", Dec. 2007 and Jan. 2008 issues. An aspect of the document often overlooked today is its grim warning that governments might �impose� contraceptive methods on citizens. Padre Pio said: "The world will be astounded at her greatness; not many years will pass before this happens. The new millennium will see Luisa�s light." Sometime in late September of 1994, shortly after my return from a pilgrimage to the shrine at San Giovanni Rotondo where Padre Pio lived and worked for over 50 years, I had my first encounter with the fabled perfume and fragrance he showers upon his spiritual children. It was after Saturday morning Mass at St. Augustine's Church in Elkridge, Maryland. I had a small photo album of my just-developed pictures from the pilgrimage, and was going to share them with a very good friend from my parish. We were just heading out from the church parking lot to get a cup of coffee and look at the photos, and suddenly a very intense, thick aroma of roses permeated the car. It seemed to be coming from nowhere in particular, and was a delightful fragrance. I asked my passenger if she smelled this very powerful aroma, and she said no, she did not. I then asked if she was wearing a perfume of flowers, and she denied that too. She said all she had used that morning was very mild and lemonish in smell. After about five minutes the aroma of roses faded away. I took this as a sign from Padre Pio that he was pleased that I had gone to San Giovanni Rotondo, and also that I was sharing this experience with others. A second experience of Padre Pio's signal of heavenly perfume occurred just prior to another pilgrimage to Italy. We were to fly out on TWA, and not long ago the tragic explosion of TWA flight 800 had occurred, killing all aboard. It was September of 1996, and I had decided to have breakfast at Frank's Diner in Jessup, Maryland, as I often did on Saturday mornings. I walked in carrying a book by Oscar De Liso, entitled "Padre Pio, the Priest who Bears the Wounds of Christ". Usually I sit at a booth, but that morning I decided to try the counter, and to perhaps be able to arouse someone's curiosity as to this Padre Pio that I was reading about. I do remember that a working class gentleman sat next to me on my left, and that there was some small talk between us. Finishing breakfast, I walked up to the cashier's booth and began paying my bill. She looked up at me and asked "Do you have a rose in your book?" At that moment, I did catch a very delicate smell of roses that did seem to come from the book on Padre Pio. I also realized that this very subtle aroma had been present for a while but I had not consciously noticed it. It was not the intense perfume that had marked the prior incident of two years ago. When the cashier spoke, I became rather excited and told her that there was no rose in the book but that this was a miracle, that this was a special gift from this saint that I was reading about. There were others present nearby, waiting in line to be seated, and I looked around to see if any one had any reaction to what I said, but there was none that anybody openly showed. After I paid and left the diner, the fragrance disappeared. I took this to be a sign from Padre Pio not to worry about making the trip on TWA, and that all would go well. I then put aside any anxiety about making this pilgrimage, and thanks be to God and Padre Pio, all did go well on this journey to the shrines of Italy. From a series of articles by Paolo Scarano, run in September of 1997 in the Italian magazine Gente. Pietruccio, Padre Pio's blind friend, talking about the time Padre Pio might have healed him. The Friar from Pietrelcina made me understand that he would have been able to obtain the grace from the Lord for my healing, giving me the ability to see again, during a particular period in his life. This episode took place between 1931 and 1933, years in which Padre Pio underwent a difficult investigation from the ecclesiastical authorities in the Vatican. It seemed absurd to me that a person as good as he was would have to submit to such harassment . I also suffered alongside him. And to relieve him from his sorrows, I asked him "Padre, why don�t you make a appeal to the Pope so that this persecution of you would cease?" He replied "Listen, my child, if we have to appeal to the Pope, I must apologize for something, implore pardon for a fault. But to me, thanks be to God, I seem to have done nothing wrong. Let us leave all to God. I am in His hands. If it pleases Him to keep me in this state, His will be done." Then he interrupted himself. He sighed and continued speaking with a remark that he often repeated to me in those sad days. "Happy you are, blessed you are Pietruccio, that you are blind and do not see the brutality of this world." The sense of solidarity I felt with him gave me the courage to say: "Padre, I am content all the same. It is enough for me to be near you. The cross of my blindness is nothing in comparison to yours." "How can you say you are content?" he asked me. "Padre, I am happy, I assure you. And he: "You are content even in this condition?" "Yes, Padre," I replied. For some minutes he was quiet. Then, all of a sudden, with a serious tone he asked me: "Pietro, do you wish to reacquire your vision?" He took me by surprise. I thought for a moment and then replied: "Padre, if to see is useful for the good of my soul, then may the Lord restore my sight. But if it is harmful to my spiritual salvation, then I prefer to remain blind. For me it is enough to know that you are near me." I immediately realized that this statement amazed him. At that time Dr. Mario Sanvico of Perugina, one of his spiritual children, was present. "Do you see?" he said turning to the Dr., "Pietruccio prefers not to see. I truly can not conceive of a blind person being contented." From then on, speaking with his devotees, he did not fail to comment how marvelous was the fact that I had refused the grace to have my sight restored. For him I had become an example of the Christian way of life, to point out with pride to the faithful. My refusal to many would seem absurd. However I was completely convinced about what I had said to Padre Pio. His presence was enough to fill me with joy, to give me the energy to meet with optimism each day. For me it was better to remain blind that to lose the close friendship with the Friar from Pietrelcina. And when his spiritual children were with him, he would point me out to them as a sublime example, of almost unmatched suffering. "You see", he would say, "he is blind. However his suffering is not without meaning. The friar said these things because he had experienced himself the drama of blindness. Few know about it, but in one period of his life the Padre also lost his sight. It happened one day in the early Twenties, when during a summer afternoon he was in the garden of the convent. While speaking with the veterinarian of the town, all at once he could not see. "I saw descend on me something like a black cloth which covered me from the head on downwards", he told me. The phenomenon lasted for many days, during which Padre Pio had need of a guide in order to carry out his priestly ministry. In that period I was his guide, accompanying him from one cell to the other in the convent, and from the church to the sacristy. Subsequently it was Padre Pio, for all of his life, who was my guide after I was the one that became blind. Padre Pio, for his part, did reacquire his sight. One day, while seated on the little wall of the convent�s garden, he became aware that the "black cloth", as he called it, which had prevented him from seeing, all of a sudden disappeared and he could see again. That experience terrified him. Later he could not understand how I, being blind permanently, had not become desperate. "My son", he would say, "I would rather lose an arm, a leg�but would not want the Lord to take away my vision." However, living close to Padre Pio, I did not think about my own cross. It was as if Padre Pio carried the cross of my own blindness together with me. As if he were giving me his own eyes. I appreciated this more when I lost my father and my mother. I was destined to be alone and blind in the world, if I did not have near me the beneficent presence of Padre Pio. Fr John Schug (OFM Capuchin), was the author of two of the most important books in English on Padre Pio, A Padre Pio Profile, and Padre Pio. He was the spiritual director on my 1994 Padre Pio pilgrimage, which was organized by another writer on the Padre, Jeanette Salerno. One of his last projects was to obtain any and all information pertaining to one of Padre Pio's most spectacular feats. During the second world war, many attempts were made by Allied air forces to bomb the small town of San Giovanni Rotondo, a city whose only boast was the monastery where Padre Pio was residing. Intelligence data spoke of a cache of German munitions in the area. But none of the Allied planes were ever able to deliver any bombs over the area. There were often mysterious malfunctions, causing the bombs to drop harmlessly in the fields, or mechanical failures which caused the planes to veer off course. But the real story is told by the pilots who did make it near the city - they reported that they were told to turn back by an apparition in the skies - a vision of a flying monk who waved them away. Most of the airmen were afraid to mention any of this until after the war, when many groups of American and British soldiers came to pay their respects to the famous friar. It was then that he was identified as that very same 'flying monk' by those who had seen him in the sky! Padre Pio for all those who asked for his prayers. so as to be spiritually united with Saint Pio. "knock and it will be opened to you." Behold I knock, I seek and ask for the grace of.�.. I now ask for the grace of���..
Close with " St. Joseph , foster father of Jesus pray for us." Translated from an article by Padre Silvano Troncarelli, Gente, 3 April 1999, N.15, Anno XLIII, p. 56. If you wish, it is possible to visit another location dear to Padre Pio, not far from San Giovanni Rotondo, and it is also found on the Gargano: the Sanctuary at Monte Sant'Angelo, which is dedicated to St. Michael the Archangel. Padre Pio visited here in 1917 and celebrated a Mass, before being transferred officially to the monastery which sheltered him for the rest of his life. For this celestial personage he had a lively devotion. He did not fail to recommend that his spiritual children invoke this Prince of the heavenly armies, conqueror of Satan and his demonic army. One curiosity: in the Sanctuary of Monte Sant'Angelo is conserved to this day the Chasuble worn by Padre Pio at the Mass he celebrated in the grotto consecrated to the apparition of St. Michael. * He prayed 36 rosaries a day, and offered his life to avert a universal cataclysm. Translated from "The Gospel of Padre Pio" a series of three articles running once a week in the Italian magazine Oggi, based on interviews with Padre Carmelo, who when young was the spiritual child of Padre Pio, and later in life became his Superior at the Friary in San Giovanni Rotondo. The articles were published beginning April 28, 1999, and were written by Gisella Pagano and Matilde Amorosi. Padre Carmelo recalled that one night, with two other Friars, he entered the cell of his spiritual father in order to wish him good night. They found him ready for bed, with a little cap on his head, tied with two loops around his neck, and with white half-gloves covering his wounded hands. To his visitors he explained: "I must pray two and a half rosaries before going to sleep". And in response to the question of Padre Carmelo as to how many he had said during the day he replied: "To my Superior I must tell the truth: I have said thirty four. I am able to recite so many because when I hear confessions and the penitents are going to need time, first I make them tell their sins, and then I permit them to speak about any others they might have. And while listening to them I say the rosary. But this, thirty six in one day, is not for you. It is enough for you to pray fewer, but it is necessary to pray, to pray." The cruel reality, that of a man very ill and morally crushed, was evident during the visits of Padre Pio's ex-Superior. Upon this holy Friar, he recounted, was imposed the praying of only one rosary per day, according to the Conventual rules, an absurd chastisement, very painful for one who normally prayed thirty six daily, passing the night in prayer. Moreover, he was forced to limit his confessions, to rest more, and to eat more; the pretense being for his physical well-being. But they never took into account the transcendental dimensions into which he had soared in the last years of his life, thereby indirectly putting into doubt his very sanctity. "In my memory my spiritual Father is similar to the figures of the Old Testament at the end of their days, a new Moses, leading not only one group of people, but a whole multitude of peoples disseminated throughout the globe. I kneeled before him to kiss his hand and to give him a filial embrace. He returned the embrace and smiled without speaking. His confrere Padre Mariano asked him "Do you recognize who this is?". The holy Friar looked at him with a stare as if he were coming out from a state of ecstasy with the Lord, and spoke: "Yes, I recognize him." Then he said this, word for word: "My son, I offer my life to the Lord in order to avert a universal cataclysm". Controversial, bold and thought-provoking, the above book is available in print or Kindle format. Padre Pio of Pietrelcina was an Italian Capuchin friar and mystic. He died in 1968 at the age of 81. Saint Pio was credited with thousands of miraculous cures during his lifetime, and is still venerated as a miracle-worker. For years the Vatican opposed the cult which grew up around Padre Pio, but then changed its attitude, granting him the highest honour possible after his death: full sainthood. Pio is revered for having borne stigmata: permanent wounds on his hands and feet like those Christ suffered at the crucifixion. He lived for decades with these bleeding wounds. Doctors never found a medical explanation for the injuries, which never healed but never became infected. Pio's followers said he bore the wounds of the crucified Christ. Even before his canonisation, Padre Pio's former monastery at San Giovanni Rotondo had become a major site of pilgrimage for Catholics from around the world. His shrine there receives eight million visitors a year. Pio's image is displayed in homes, shops, garages - even on the backs of trucks - in many parts of Italy. Pio was canonised by the late Pope John Paul II . John Paul II was said to have a special affection for Padre Pio, and as a young man travelled to his monastery in southern Italy for confession. The approval of Padre Pio's sainthood took place in record time, but during his lifetime many in the Church doubted claims of his miraculous cures and suggested he was a fraud. Pio was said to have known what penitents would confess to him. He reportedly wrestled with the devil in his cell. In granting him sainthood, the Church officially recognised two of his miracles: the curing of an 11-year-old boy who was in a coma and the medically inexplicable recovery of a woman with lung disease. In 2007 the Catholic Enquiry Office (CEO) in London declared Saint Pio as the patron saint of stress relief and the January blues. This followed research from a health psychologist at Cardiff University that named 22 January as the single most depressing day of that year. The formula is based on the poorest weather, seasonal debt, the anti-climax after Christmas, the abandonment of New Year's resolutions and the dates when motivation levels hit rock bottom - and the date chosen is always a Monday. We see this phrase as providing the all-time January pick-me-up slogan. Spiritual things can connect with modern day life and every day issues. The spiritual journey is at the heart of all of our experiences from the post-Christmas blues to marking key moments in our lives. She claims that prayer is an important aid to relaxation regardless of one's personal beliefs about God. Gathering one's thoughts and having a quiet time, she says, brings new hope. In turn, this helps to offset worries and gives people a new perspective on life. 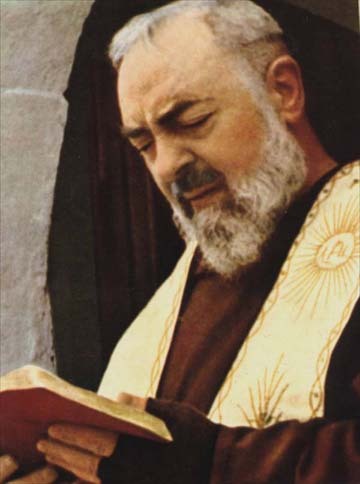 St Pio is the perfect saint for Don't Worry Be Happy day. He was a man who suffered in many ways but because he discovered that all of life has a purpose, he found a deep joy and lasting peace that he wanted to share with others. We hope that people will be helped through the January blues and perhaps be introduced to a new way of affirming and energising living which is ultimately found through meeting a person - Jesus Christ. Please help the Padre Pio foundation .com Please donate. Thank you.